Stitch size 46 by 46. 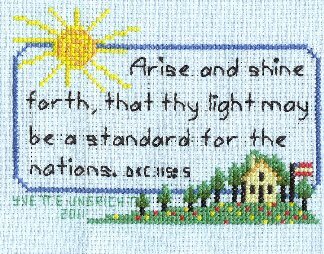 Model stitched on 10 count Light Blue Aida. Finished size is 4 1/2 inches by 4 1/2 inches. 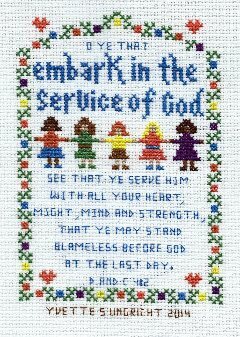 May also be stitched on 14 count Aida. Finished size will be 3 1/2 inches by 3 1/2 inches. 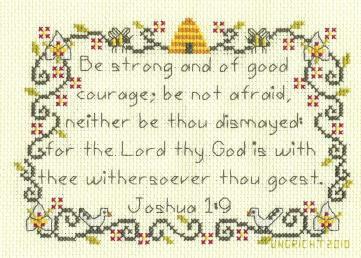 Counted Cross Stitch Chart. 264 stitches wide by 119 inches high. 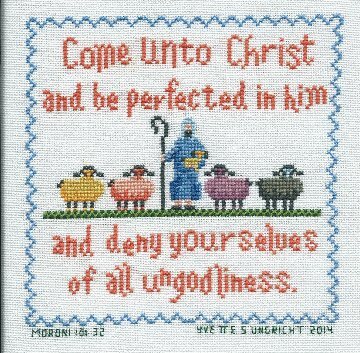 Model stitched on 24" by 15" piece of 28 count white even weave cross stitch fabric with 2 plies of DMC floss over two threads. 14 or 16 count Aida cloth may also be used for ease of stitching. Finished size 17 1/2" wide by 8 1/2" tall. Retail price: $15.00. 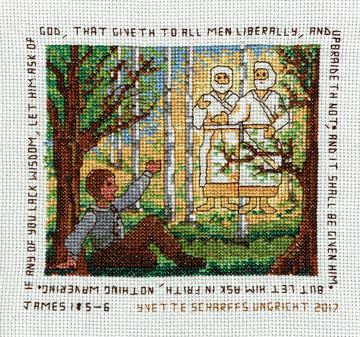 Very Advanced Counted cross stitch chart based on William Clayton's hymn "Come, Come Ye Saints." Stitch size: 142 stitches wide x 576 stitches tall. 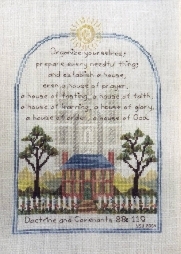 Sampler stitched on 32 count cream cotton even weave. You could use white or cream, cotton even weave or Belfast linen. I prefer the cotton even weave because the individual thread sizes in the fabric are more consistent. Do not use Aida cloth. Some of the stitches are over one thread. Because of the size of this sampler, make sure you use 32 count or smaller because most of these fabrics are not wide enough for the length of this sampler. Finished size: 16 inches x 45 inches. Will need to be custom framed. Winner of the "Award of Merit" in the 6th International Art Contest sponsored by the Church Museum of History and Art, 2006. 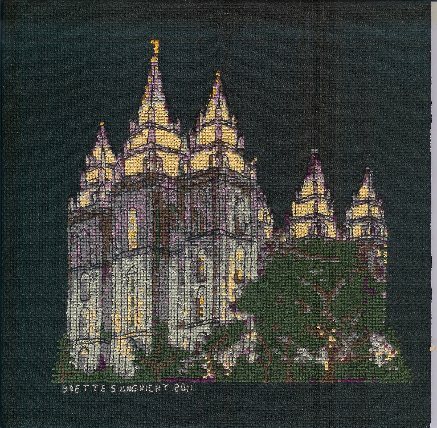 1st place winner, Utah State Fair, 2005. Includes a color photograph, chart and sampler stitch descriptions. Finished size on 16 count is 7" x 7"
Fits into an 8" x 8" pre-made or custome frame. Can also be stitched on 14 count black Aida cloth. 13 3/4" x 17 1/2" on 32 count cotton even weave. 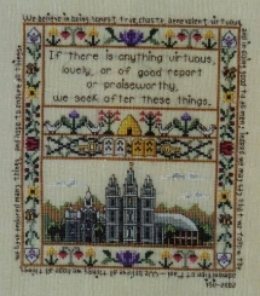 May also be stitched on Aida. 14 count Aida will yield a 15 5/8" x 19 3/4" finished stitching size. Sample stitched on 32 count cream Irish linen over two threads. Also suitable for 16 or 14 count Aida cloth. Finished size for 16 count fabric is 7 inches by 8 1/2 inches. Will fit into a pre-made standard document frame. 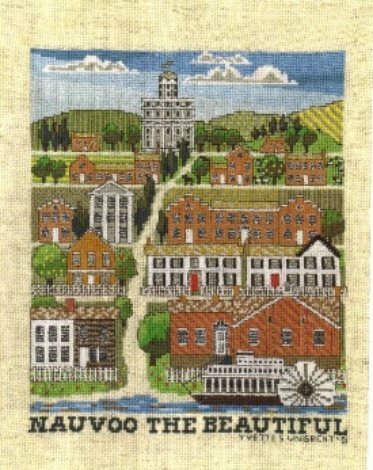 Counted Cross Stitch chart featuring buildings from Nauvoo, Illinois. 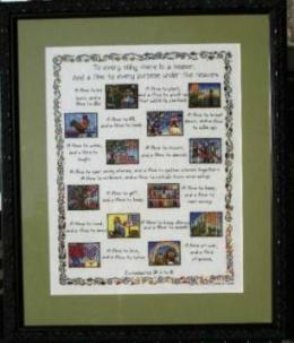 This chart was my first and has been one of my best sellers. Stitch Size: 124 wide by 153 high. Model stitched on 18 count natural Aida. Finished size is 7 inches by 8 1/2 inches. May also be stitched on 16 or 14 count Aida. Use an unbleached Aida or light brown as the color of the road is the color of the fabric. First Place, Utah State Fair, 2001. 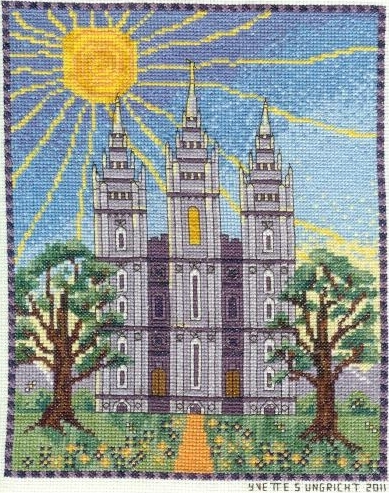 Counted Cross Stitch chart featuring the Salt Lake Temple, Assembly Hall, Tabernacle, Lion House and Beehive House. Stitch Size: 133 wide by 42 high. Sample stitched on 14 Count light blue Aida cloth. Finished size is 9 1/2 inches by 3 inches. Will fit into a pre-made panoramic photo frame. 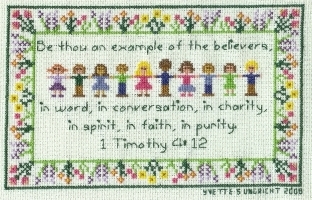 Counted cross stitch pattern with two size and color options. These samplers were stitched on 14 count Aida cloth with 2 plies of DMC floss. This pattern can also be stitched on 16 count Aida cloth or linen over two threads. Stitch size is 81 wide by 85 high for the large sampler and 49 by 79 for the small sampler. The large pattern fits perfectly in a pre-made 8"x8" frame. It can also be finished into a 14" pillow by adding fabric borders, a back and a pre-made pillow form. On 14 count the finished size is 6" x 6". Cut your fabric 10" by 10" to allow for wear and fraying. The small pattern fits perfectly into a 5"x7" pre-made frame. 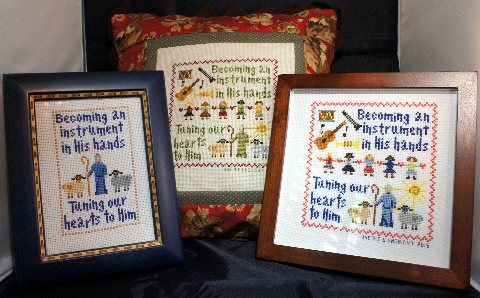 Instructions are given for two different color options for the large pattern: A summery sampler with corals and blues and a wintery sampler in greens and garnet.